Kevin Alas, 12, of East Boston (left) was tagged as campers play a game of sharks vs. fish. In the midst of serene Boston Harbor, the sounds from one vessel punctuated the waters as 450 young passengers, many with tear-stained cheeks, made emotional farewells. They sobbed, cheered, laughed, and shouted. They made bold declarations — “I’m going to miss you guys!” one camper announced into a can of Pringles converted into a megaphone — and vowed to stay in touch as the Provincetown II sailed away from Long Island on Thursday. What could justify such varied, frenzied emotions? It was the last day of summer camp. The voyage back to Boston signified the end of Camp Harbor View, a day camp in its eleventh season. To attend, campers — 11 to 14 years old — pay $5 to spend four weeks swimming, sailing, biking, making arts and crafts, and more. 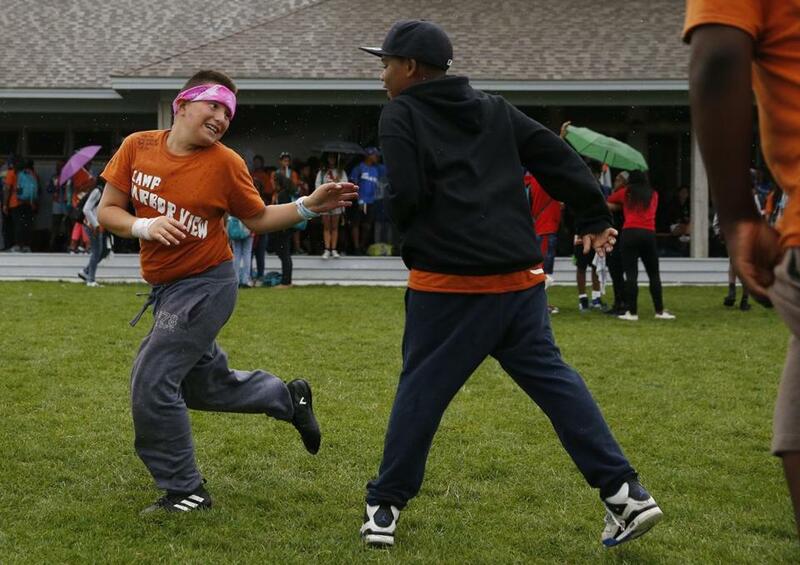 The idea for the camp came from the late mayor Thomas M. Menino and businessman Jack Connors, who wanted to give kids from some of Boston’s at-risk neighborhoods a respite from the city. And though four weeks might feel short, campers said they gained more than they thought possible in that time frame — more confidence, more leadership skills, and perhaps most importantly, more friendships. Greg Stoddard, executive director of the camp, said the youths come from a variety of backgrounds, though many are experiencing extreme hardships — this session alone, 30 campers were homeless. 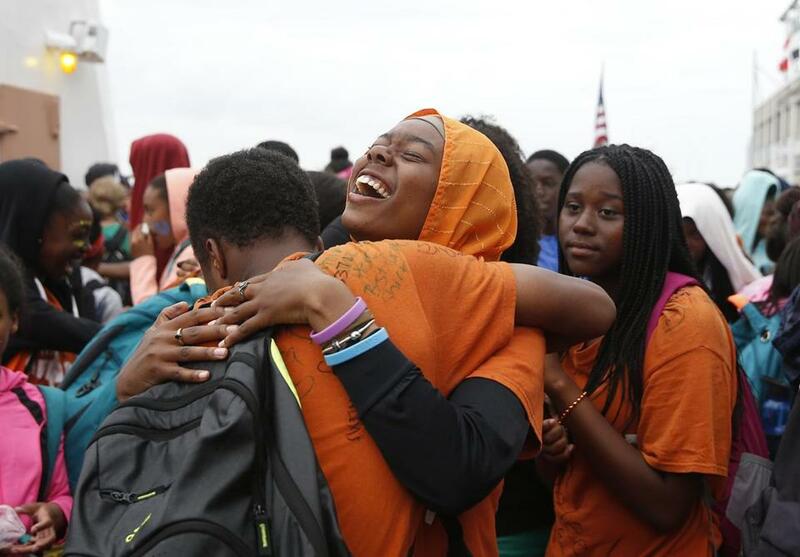 Matiniah Yahya, 15, of Jamaica Plain (center) laughed as she hugged Jaleel Heath, 13, of Dorchester (left) as they took their last boat ride off of Long Island. 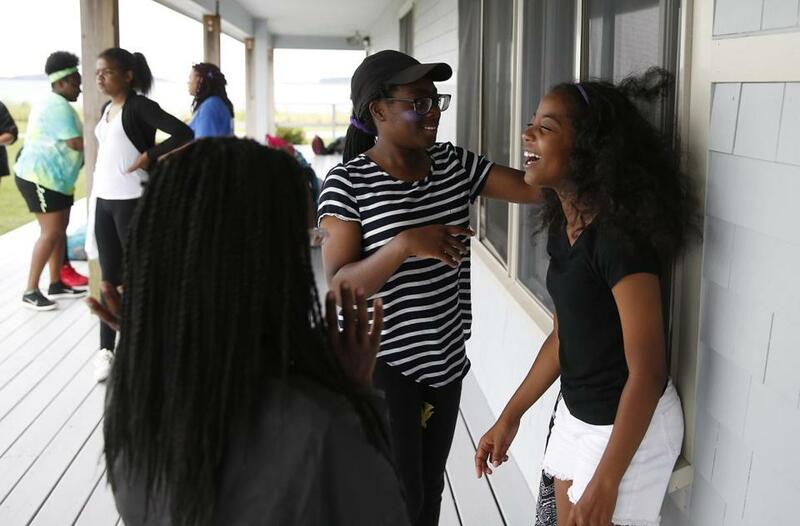 Even the ones with homes often come from areas that are ridden with violence and crime, like Shaniyah Mahabir, 12, who said one of the things she’ll miss most about camp is playing outside. “A lot of things happen [at home], and my mom doesn’t like me playing outside alone,” she said. It’s these little luxuries that often go forgotten, like playing under the summer sun without worry, that make Camp Harbor View feel like a haven. But on Thursday morning, Mahabir had other, more pressing concerns, like the Camp Harbor View Hustle, an hourlong relay of biking, sailing, and other skills she had spent the last few weeks learning with other campers. As Stoddard watched hundreds of campers cheer for the final teams in the relay, he acknowledged that some of the kids haven’t been successful in other programs because they’ve built their identities on their failures. But instead of focusing on the issues, Stoddard said, the staff at Camp Harbor View find what’s right with the campers instead of dwelling on what’s wrong — an easy thing to do but a hard thing to claim. “When you say the words ‘Roxbury,’ ‘Dorchester,’ ‘Mattapan,’ there are some really negative images that come up, and they shouldn’t, because they are fantastic communities with a ton of strength,” Stoddard said. And yet, it seems the people who need to be convinced of this the most are the campers from those areas who define themselves by their shortcomings. Stoddard, who has been with the camp since 2007, recalled one camper introducing himself as “Anger Management,” before even getting to his name. Another camper, a 13-year-old girl, was heavily medicated and locked in a psychiatric unit just two weeks before camp because of behavioral problems. From left: Krystal Gentle, 11, of Roxbury looked on as Natalia Edwards, 12, of Jamaica Plain placed Sadie Metellus, 11, of Boston in front of the fan so her hair could blow in the wind. Camp is for people like them, Stoddard said. Because whether campers have a perfectly stable, middle-class life with great support or they’re on their 23rd foster family this year, they all have something in common: They’re learning how to swim, or play basketball, or be an artist. “It goes from something you do to something that you are,” Stoddard said. Following the relay, campers gathered for a quick lunch before the main event of the day, a talent show with singing, dancing, magic tricks, and step dancing. Their orange Camp Harbor View T-shirts turned into costumes, and water bottles doubled as microphones while the audience sang along. 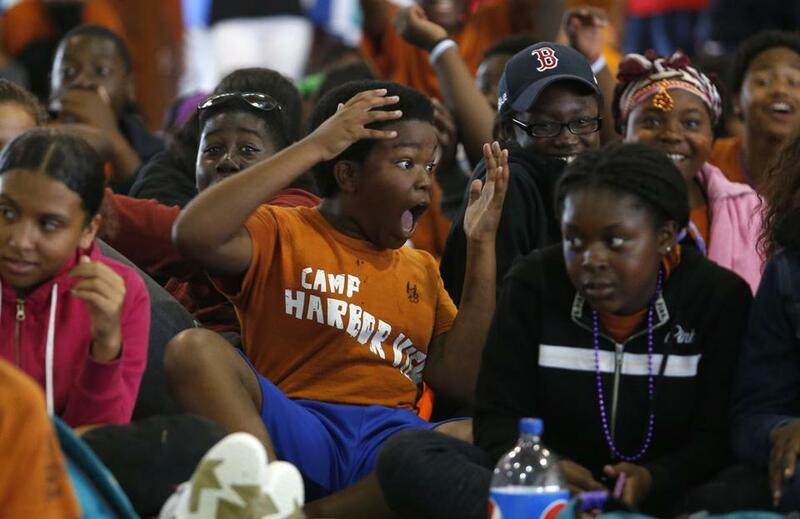 Zachary Leung-Tat (center) reacted to a magic trick done during the talent show at Camp Harbor View. As the day came to a close and the boat reminded campers of their world beyond the island, camp president Sharon McNally acknowledged that changing a life is hard to do in just four weeks. “We have 900 kids a summer; we don’t change 900 lives,” she said. But maybe it’s the little life changes — learning how to swim, making a new friend, stepping up to sing in a talent show — that set the wheels in motion for the bigger ones, like returning to camp as a “leader-in-training” or choosing to go to college because they’ve seen their camp leaders do the same. And that makes camp worth a boatload of tears. 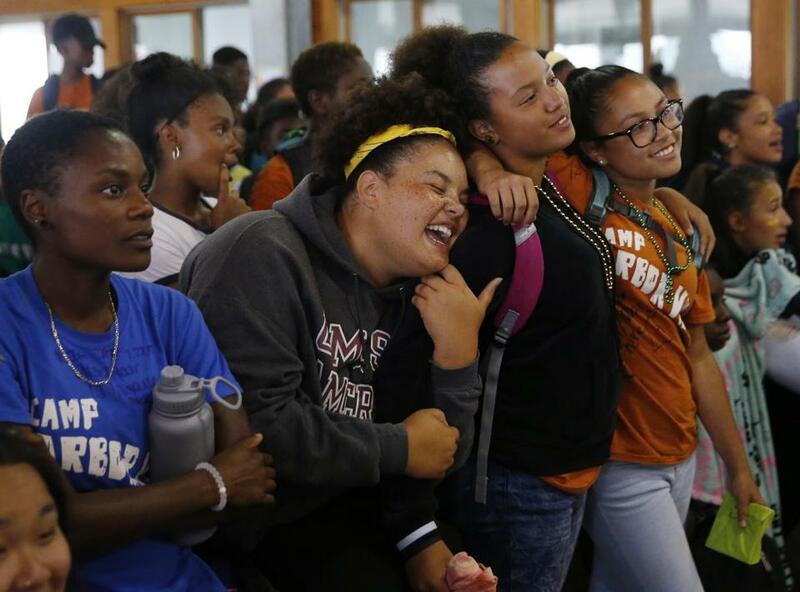 From left: Damaris Sweeney, 21, of Milton, watched the slideshow as her fellow group leader Paige Belfield, 20, of Boston sang along to the song playing and serenaded to her campers Maya Thompson, 16, of Dorchester and Lesley Pires, 13, of Brockton.